The Jagua juice ink extract (Genipa Americana fruit juice) is 100% pure, unpasteurized and undiluted. It is freshly squeezed from the fruit and transferred through filters to give you the best ink. For deep blue stain, you can actually mix it into cassia powder (cassia obovata) or with henna powder and create different varieties of brown henna shade stains. 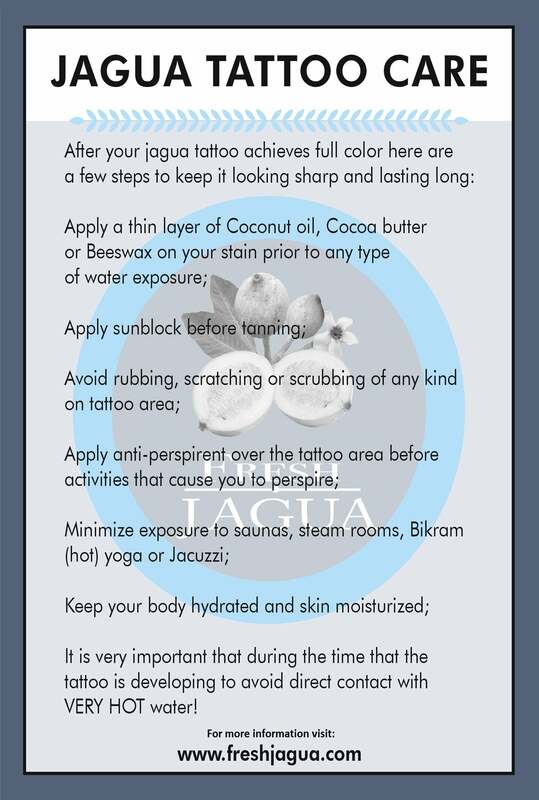 ANOTHER benefit of the JAGUA fruit juice INK extract is that you can refresh old gel/ink by simply blending few drops into the Jagua ink. You can even make your own gel with your ingredients by using the fruit juice ink Extract. Note that the consistency of the FRUIT juice INK is like water. There are several sizes to choose from, as little as 2.5 oz. and as big as 169.07 oz. (5 liters). The 2.5 oz. is packed in an aluminum bottle while the bigger sizes are packed in plastic bottles. 100% Pure/undiluted, unpasteurized Jagua fruit juice ink (Genipa Americana fruit juice ), sque..